The UK has not sent even one gram of flour or a single blanket to Aleppo since the Syrian conflict began, the Russian Defense Ministry said responding to a spokeswoman for Downing Street, who said Russia is stopping aid deliveries to the besieged city. “It seems that the UK government has lost an objective view of what is happening in Syria, including Aleppo, due to Russophobia,” Russian Defense Ministry spokesman Major General Igor Konashenkov said on Saturday, noting that the UK has not sent “a single gram of flour, any medicine or blankets to help” civilians in Aleppo during the whole Syrian conflict. “If the UK government really wants to send humanitarian aid to residents in the eastern neighborhoods [of Aleppo], it has all conditions for doing this, just tell us where it [the aid] has been held up." “If there is no such British humanitarian aid for Aleppo, then don’t obstruct others from helping,” he added. According to Konashenkov, since November 28, Syrian troops have liberated almost half of Aleppo’s neighborhoods from terrorist and rebel militants. 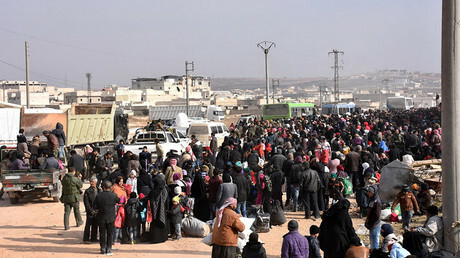 More than 90,000 civilians have been rescued in these areas, he said, presenting statistics from the Russian Defense Ministry. Over 28,000 civilians, including 14,000 minors, have fled the rebel-controlled neighborhoods of east Aleppo, he added. “All this time, the residents of the eastern neighborhoods [of Aleppo] have been receiving humanitarian aid, medicine, and warm clothes from the Russian Centre for Reconciliation and the Syrian government on a daily basis,” Konashenkov said. On Wednesday, the Daily Mail reported that British Prime Minister Theresa May’s spokeswoman had claimed that Russia is, in effect, blocking aid intended for Aleppo’s civilians. “The Syrian regime and their influencers [be it Russia, or others] are preventing aid” from reaching the city, she said, alleging that they are doing this in two ways. “One, they [the influences], in a sense that the Syrian regime backed by Russia are not agreeing to a halt or a cessation of hostilities so that you can get aid in, so by that they are stopping it. Two, if you look at the actions they have taken at the UN Security Council, they vetoed a resolution that called for aid to be brought into Aleppo and to end the bombardment of Aleppo,” she said. The Syrian army is currently engaged in a major operation to liberate eastern Aleppo from rebel militants and terrorists from Al-Nusra Front, Al-Qaeda’s branch in Syria that has recently renamed itself Jabhat al-Nusra. This week saw a breakthrough for the Russian-backed Syrian operation to free eastern Aleppo, which has allowed tens of thousands of civilians in the recaptured districts to get access to humanitarian aid, Russia’s Defense Ministry reported on Tuesday.